The official publication of the YWLL was "Young Worker", published on both a monthly and bi-monthly basis, starting in the mid-1970's. From the "Daily World" of December 14, 1974, in an article entitled "Many notables greet YWLL convention", the cream of the CPUSA and its supporters were listed as "signers" of a "statement of solidarity" with the CPUSA's youth group. "Several dozen progressive union, community, religious and political leaders have sent a statement of solidarity to the Third National Convention of the Young Workers Liberation LeagueYWLL which opens here (Philadelphia) tonight." "The statement expresses good wishes for the success of the convention and supports the League's right to "invite and receive international guests of their choosing without State Department restrictions and to conduct their convention of government harassment and interference (sic)." ""The overwhelming majority of youth seek a path of struggle out of the crisis," the statement says, and expresses confidence that the convention will "help chart new directions which can make the mid-70's a period of new dramatic youth upsurges"." Anthony Cascone - USWA, N.J.
Prof. Howard Parsons - University of Bridgeport, longtime CPUSA supporter and writer for their theoretical journal "Political Affairs"
Doris Ponsolle - Brooklyn coordinator, Women Strike for Peace WSP, wrote letters to the CP's papers, "Daily World" and successors, including the Daily World, May 28, 1983, p. 6, "Monopoly Danger", Doris Ponsolle, Brookly, NY. 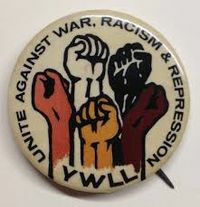 The names of the members of the YWLL are listed here from many sources, both from the CPUSA newspapers as well as from government hearings/reports/studies, and related print media sources. Phillip Allen - "a Black youth framed on charges of murdering a police officer"
Evelina Alarcon Cruz - Evelina Alarcon - director of the Instituto del Pueblo, a CPUSA front. Id. and then later open leader of the CPUSA, and YWLL. Sister of a later L.A. City Council member, Ricardo Alarcon, indicted in 2010 for criminal acts. From the same issue, same page of the DW, an announcement for Philadelphia, for May 16, 1976, "WW II Years, Post-War Period - Its Relevance to Youth Today", Daniel Spector, YWLL, Assistant Editor, Jewish Affairs, participant convention of Jewish Students Network. To be held at the YWCA, 2027 Chestnut St. Sponsor: Progressive Cultural Club of Philadelphia - a CPUSA front for their Jewish members, often operating under the generic name of Cultural Club of named city, esp. Miami. The Subversive Activities Control Board held hearings into the Communist Party creation and dominance of the YWLL, issuing a published report under the title of "Subversive Activities Board, Docket No. 129-71, Attorney General of the United States, Petitioner v. Young Workers Liberation League, Respondent, Oran H. Waterman and Robert A. Crandall for petitioner. John Abt and Abraham Unger for respondent. Report and Order of the Board, Decided January 15, 1973"
Those named as leaders and/or members of the YWLL during the course of the investigation/hearings (biographical information on each person was also included in this listing (pp. 73-83 of report, pages 281-291 of the HISC hearing reproduction of the SACB Report). Mike Zagarell - Director of Education, Educational Secretary, Educational Secretary, and National Education Director, and CPUSA; Youth Director, YWLL. 1968 Party candidate for Vice President of the U.S.
Leo S. Jackson - CPUSA Trade Union Director, Western Pennsylvania District of the CPUSA: Expelled from the Party before the YWLL was formed. Cooperating government witness. Pettis Perry - "was a leading member of the Communist Party"
Jose Stevens - leader of the Harlem Concentration Club of the CP, National Committee 1969. "The Ohio section of the Young Workers Liberation League decided at its section committee meeting this past Saturday to double its quota of youth to attend the People's Bicentennial Festival in Chicago on June 29." With Jay Schaffner, national educational director of the YWLL in attendance, lively discussion centered on how to build for the Festival." . . .
"The meeting was held at The Greater New Light Baptist Church, where Rev. Fred Shuttlesworth is the pastor. Rev. Shuttlesworth addressed the League members at the beginning and end of the meeting." Rev. Fred Shuttlesworth - a national leader of the Southern Christian Leadership Conference SCLC of the later Dr. Martin Luther King, Jr., he has amassed a significant record of participation in CPUSA fronts and causes, including SCEF, the Mobes Spring Mobilization to End the War in Vietnam. New York YWLL Source: Daily World, December 12, 1978, "Dance to follow Robeson Salute"
Galo Contreras - "organizational secretary of the (New York YWLL), ..." "THe New York Young Workers Liberation League will be giving a disco-dance, at 235 West 23 Street, 2nd Floor, following the Youth Salute to Paul Robeson Concert." Source: "Daily World", Wed. June 15, 1977, P. 12, "Senatorial candidate hits unfair utility rates", Newark, NJ. Charles Cascone "Cascone is an auto worker, was active in the civil rights and anti-war movements, and is a founding member of the Young Workers Liberation League (YWLL)". "Charles Cascone, independent candidate for the Senate in the 28th Legislative District blasted the Public Service Electric and Gas Company (PSE&G) at a public hearing May 31 before the Public Utilities Commission for its inequitable rate structure." This page was last modified on 6 August 2018, at 04:38.